Remember, me told ya me would talk about the apes and monkeys that live in Ouwehands Dierenpark. They have a lot of cute ones, scary ones and gorgeous ones. 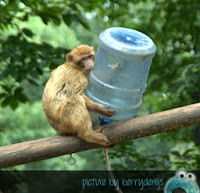 They have some different kinds living at the zoo. Me loved that. Me like monkeys, so me went on a tour des apes with a cheeky bunch of Orang-Utans… still me is wondering if they had driver’s license or were just monkeying around. A well… let’s go! First stop: the Lar Gibbons. This family lives near a large patio and restaurant, with water and lots of trees and stuff to play in. They just had some veggies to eat. And while they ate lunch, they checked out all the people eating theirs. That was kind of funny! 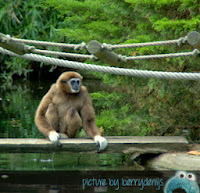 Then they took me to see the Barbary Macaques. Gorgeous little devils who were sleeping in the sun, searching for flees in others coats, or this little fella (or girl) who was a tad sad because the drum he hoisted up was empty… you can see him hugging the drum. Me thinks they get food in it, so they have something to do. Next up me went on a visit with the Orang-Utans. They are so gorgeous. Me love their orange coats. And just the whole way that they are. 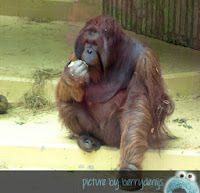 Me saw this beautiful male in the Orang-Utan house and the little acrobat was playing outside. 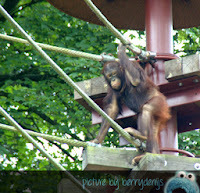 He was really adventurous crossing the ropes with ease high in the sky! Me had to look up to keep track! 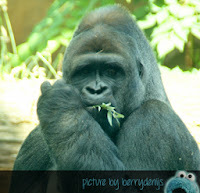 The end of the monkey tour they took me to see some real heavyweights, like this friendly plant eating Gorilla. 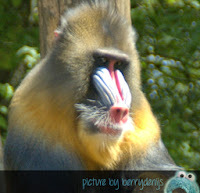 And this colourful Mandrill. The first one looked really gentle, minding his own business, eating some leafs from twigs, while the Mandrill scared me just a bit. Okay, the blue on his nose is gorgeous, but me thinks it is a tough cookie to crack, so me left him alone. Well, needless to say the cheeky Orang-Utans were very nice. They did not even charge for the tour! 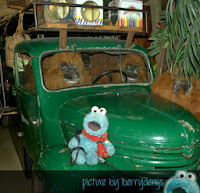 Me was glad, because me had only a cookie to give away and to be honest… me thinks cookies aren’t that good for monkeys and apes!